Holy frozen Ice Burghs, it is cold outside! This is more than just your average Western Pennsylvania January cold. We’ve heard a number of terms thrown about on TV and social media trying to keep us in the loop of where this chilly weather comes from, but let’s explore this a bit more, shall we? Grab a fuzzy blanket and a cup of tea—we’re headed to the Arctic! This phrase didn’t enter our vernacular until about five years ago, but “polar vortex” has long been the term for the swirling mass of cold, low pressure air at each of the earth’s poles. The vortices are typically strongest during their respective winters (currently happening in the Northern Hemisphere) and weakest during the summers (currently happening in the Southern Hemisphere.) Since the vortices rotate thousands of feet above ground, you wouldn’t feel them standing at ground level, but we can certainly feel their effects on the jet stream, and subsequently, our weather. 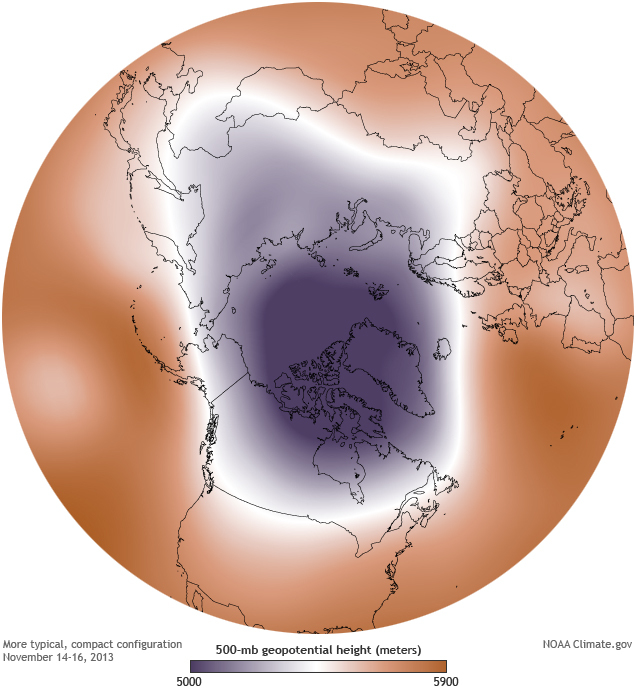 The northern polar vortex. Photo credit: NOAA, the colors represent a function of air pressure, reflecting the low-pressure system that is a polar vortex. In broad terms, a jet stream is a “river of air,” or fast-moving winds, that wraps around the globe and separates a cold air mass from a warm air mass. Our polar jet stream is the boundary between the cold air around the Arctic and the warmer air coming from the south or equatorial regions. The “river of air” doesn’t follow a single path around the globe; it weaves north and south, constantly moving, bringing weather fluctuations along with it. In the NASA video below, you can get an idea of the how the “river of air” travels around the globe. The animation reflects thirty days of jet stream activity. In this video, the colors indicate wind speed. Reds indicate higher wind speed, and the darker the red, the faster the wind—up to roughly 100 mph. When the polar vortex is stable, the jet stream is stronger and circles the globe with less “meandering.” However, when the polar vortex is unstable, this can weaken the jet stream, which allows the river of air to meander like a stream. When this happens, we notice all sorts of unusual weather patterns. In addition to Arctic blasts like we are currently experiencing, an unusually weak jet stream was also a factor for Hurricane Harvey stalling in place over Houston in 2017. 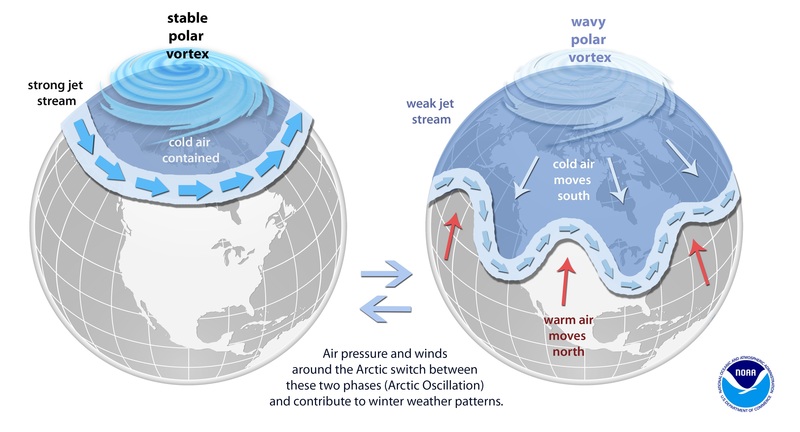 Photo credit: NOAA, The Science Behind the Polar Vortex. What affects the strength and stability of the polar vortex? Quite a number of factors, but one factor that has become the subject of more attention in recent years is the “extent” (total area) of sea ice in Arctic. For example, in 2014, one team of researchers determined that when sea ice was slow to freeze in November-December, the strength of the polar vortex decreased in January-February. 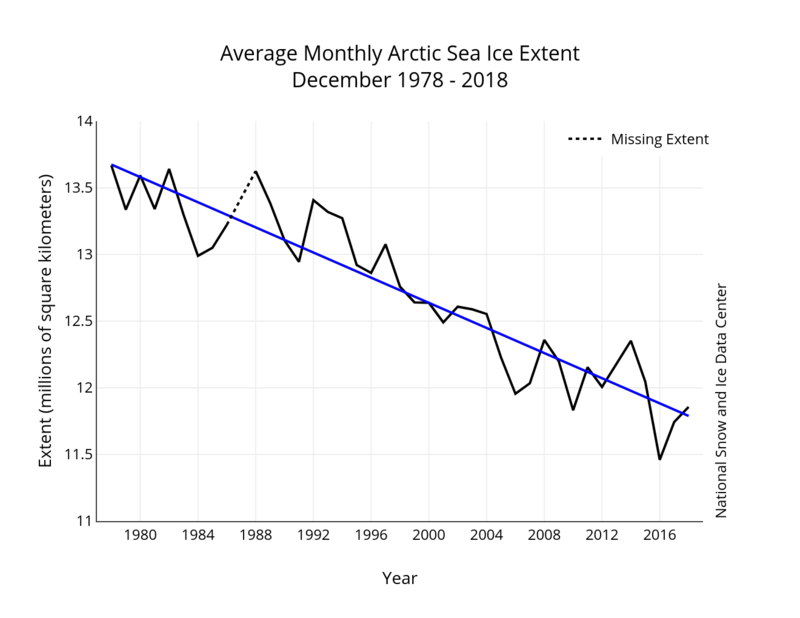 Another paper, which is coming out this year, used over thirty-five years’ worth of data to draw the conclusion that, similarly, years with lower sea ice extents have distinctly weakened polar vortexes. Other studies (such as this one and this one) all have noted the possible shared responsibility of sea ice loss in polar vortex events. The trouble is we seem to be losing that Arctic sea ice as climate change progresses. As a normal part of yearly cycles, every spring and summer, a great deal of the sea ice melts, but it begins to refreeze when temperatures drop again in the fall and it continues to freeze throughout the winter. However, since satellite monitoring of Arctic sea ice extent began in 1979, the trend has been towards a steady decline in sea ice extent. Credit: National Snow and Ice Data Center, retrieved 29 January 2019. Remember, though, everything in nature is connected. Climate and weather are indeed complicated, and it’s impossible to single out a lone determining factor in nearly any single weather event. However, the frequency of extreme weather events has increased in recent decades, and that is a trend of climate change that we cannot ignore. Instead, we can act together! There are many things you can do at home to have a big impact on climate change, and on an even larger scale, you can take active steps to reduce our dependency on fossil fuels. And in the meantime—keep warm, folks! Connecting to the Outdoors Tip: This deep cold may not leave you feeling too adventurous, but if you and the kids are looking for some interesting data to explore, the National Weather Service keeps archived data on all sorts of metrics like precipitation, temperature, humidity, wind, etc. Try practicing making graphs or predict what the next week’s weather will bring based on the previous years’ data for that same time span! Great blog as usual Maria! Very informative!